After more than 30 years of political assassinations going unpunished, Lebanon finally seems to be embarking on a new era of accountability. In recent weeks, the UN Security Council has decided to set up a special tribunal on the murder of former Prime Minister Rafik Hariri. The decision makes it clear not only that the time for impunity is over, but more importantly that chief UN investigator Serge Brammertz believes he has enough evidence to put someone on trial. The international court will be the first to try a crime described as "terrorist" by the UN. While other special tribunals have dealt with war crimes and crimes against humanity, like in Sierra Leone or Cambodia, it will be the first time that international justice tackles a political crime that targeted a specific person. For those who dismissed the UN investigation as a politicised affair meant to frame Damascus in the Hariri murder, this is a sobering development. On 30 March, the UN Security Council unanimously voted to authorise Secretary General Kofi Annan to start negotiations with Beirut to establish the UN-backed tribunal in the Hariri murder. 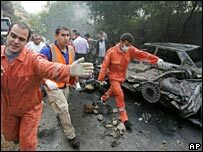 The former Lebanese prime minister, a self-made billionaire, was killed on 14 February 2005, along with 20 others in a massive blast on Beirut's seafront. The assassination was widely blamed on Syria, but President Bashar al-Assad repeatedly denied that his country had anything to do with the murder. 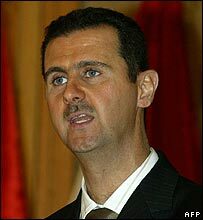 Mr Assad did say, however, that if any Syrian was to be found to be involved he would be brought to justice in Syria. But with the establishment of the special court, a domestic Syrian trial would not be acceptable to the international community. So far no Syrian suspects have been named in the investigation, even though the first report issued by the UN team implicated top Syrian and Lebanese intelligence officials for planning and implementing the murder. Four of Lebanon's once feared top-security chiefs, all allies of Damascus, have been in jail since last summer on charges of "murder, attempted murder and carrying out a terrorist act" in connection with the killing of Hariri. The investigation continues and is expected to last until at least mid-June when Mr Brammertz, a Belgian prosecutor and deputy prosecutor of the Hague-based International Criminal Court, is due to present his second report into the murder. The tribunal for the Hariri murder was approved in record time. In December, the UN Security Council passed Resolution 1644 acknowledging Lebanon's request to set up a special tribunal. The political context of the crime and the scrutiny Syria has been under means that the international community is particularly interested in speeding up this process. After the first six months of the investigation under Mr Brammetz' predecessor, Detlev Mehlis of Germany, which were high in drama, the probe has become more low-key. The Belgian prosecutor appears to be busy with building a case based on the evidence gathered so far, and media reports say good progress is being made. But the UN team is still waiting to meet the Syrian president. There is still a lot of work to be done before the court is established. A team of legal experts led by UN legal counsel Nicolas Michel is due in Beirut over the next few weeks to discuss the details. The special court is expected to be a hybrid, with Lebanese and foreign judges to ensure impartiality. This is a relatively new instrument of criminal law that has already been used in Sierra Leone for example. The judges would use a mix of Lebanese and international law, but the death penalty which is available in Lebanon would not be applied. The location of the court is still undecided, although it is certain to be outside Lebanon because of security concerns. Cyprus has been suggested because of its proximity to the country - this would also enable the Lebanese to feel closer to the process and it would help control the costs involved. But some legal experts in Lebanon believe The Hague would lend more credibility to the trial and has the necessary infrastructure and expertise in dealing with such courts, unlike Cyprus. Estimates for the running costs of the tribunal vary, but they are thought to be about $25m year with no clear indication of how many years the court would have to remain in place. Lebanon has pledged to secure the funding, but is bound to face hurdles in the process. The formation of a court to try the killers of Rafik Hariri is likely to be a learning experience for both Lebanon and the UN.